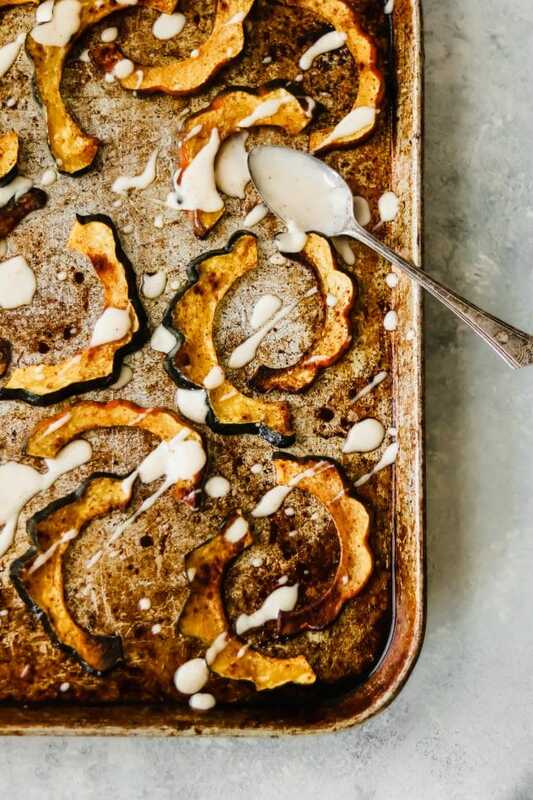 Winter squash season is almost here and this roasted acorn squash, seasoned with cinnamon, and served with a maple aioli is the perfect simple side dish. Winter squash varieties have recently become some of my favorite vegetables (well, technically a fruit but eaten as a vegetable). Their mild flavors make them versatile and palatable. 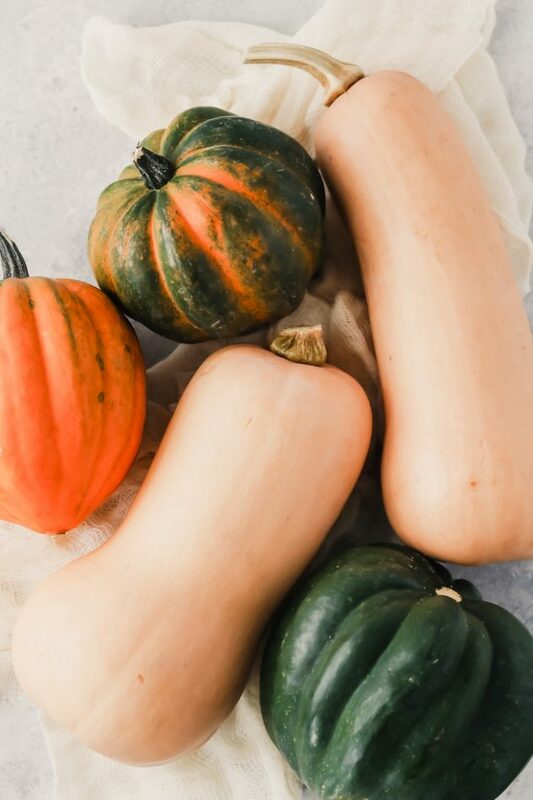 If you’re looking for additional ways to incorporate more nutritious foods into you or your family’s diet, try these winter squash varieties. Acorn squash has some really incredible nutritional benefits, too. It’s loaded with Vitamin C and A, thiamin, and B-family vitamins, as well as several minerals. 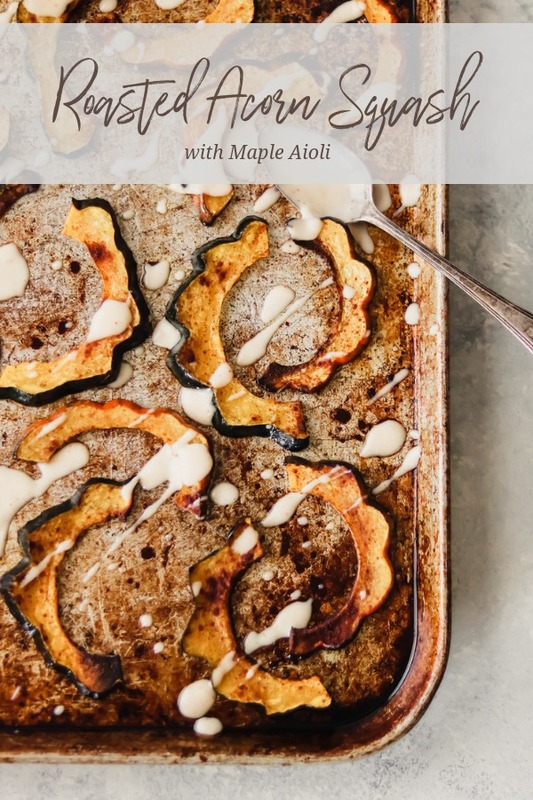 The roasted acorn squash in this recipe is the perfect side dish for the autumn or winter season. Seasoned with a bit of cinnamon and served with a sweet and salty aioli, mmmm so good! The great part about acorn squash is that you technically don’t need to remove the waxy skin from the outside. As it bakes, the skin becomes soft and edible. Plus, that gorgeous green color looks so good next to the orange flesh. Food should look pretty, too, right?? 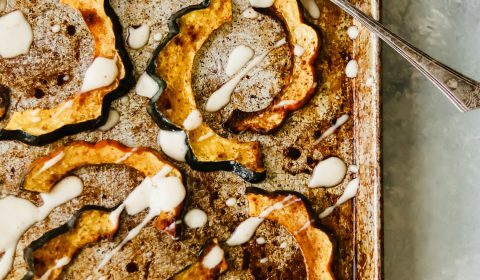 The flesh of the acorn squash has a hint of sweetness to it, which pairs well with the cinnamon spice. To prepare the squash for baking, you’ll simply cut the squash in half horizontally, scoop out the seeds, then begin to cut slices from each half, which should give you nice rings to work with. I opted to cut the full rings in half, as you can see in the pictures. Then, simply drizzle with olive oil, sprinkle with cinnamon and bake for 30 minutes. For the aioli, it’s a simple mixture of mayo, maple syrup, salt, and cayenne pepper. It’s a nice sweet + salty dipping sauce with just a hint of heat. You can drizzle the aioli across the baked rings if you’re serving as a side dish, or you can use as a dipping sauce if you’re serving them as a snack. Using a sharp knife, cut each acorn squash horizontally. Use a spoon to scoop out the seeds and scrape the sides smooth of each half. Next, begin slicing each half horizontally into 1/4 in. rings. Cut rings in half again, if preferred. Line onto a baking sheet. 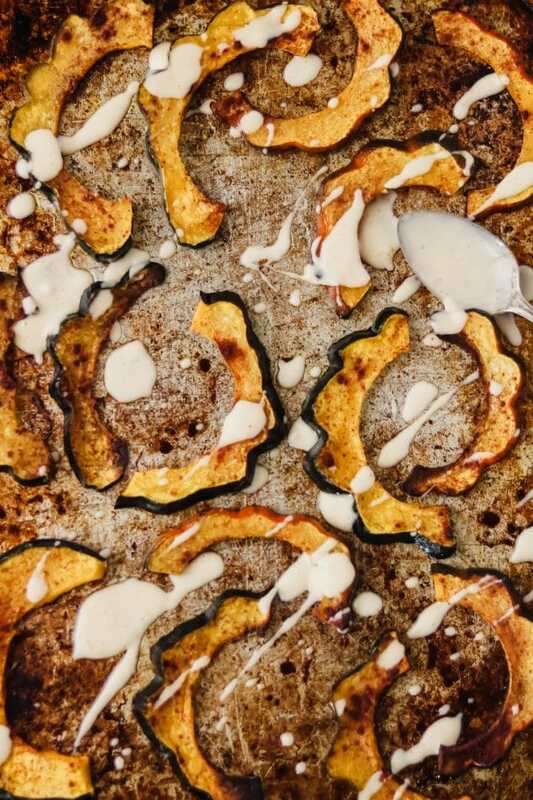 Drizzle the cut squash pieces with olive oil, then sprinkle with cinnamon. Place the baking sheet into the oven and bake for 30 minutes. While the squash is baking, begin mixing your aioli. In a small mixing bowl, combine the mayo, maple syrup, salt, and cayenne pepper. Stir to combine, then cover and place into the refrigerator until ready to serve. Once the squash is done baking, remove from oven. Drizzle with aioli or serve with aioli on the side.